Was it similar to this bug? I couldn't reproduce your problem, the walls looked correct and I had no problem to create a room with a double click. Maybe it was due to a temporary computed value that disappeared when the program was relaunched? After reloading the file, the problem was solved. It was similar to the first stages of the bug you showed. That bug also started with a "strange" connection, that became worse after splitting the wall again. I just released a version 3.4 beta 13 with a few bug fixes. Hello! 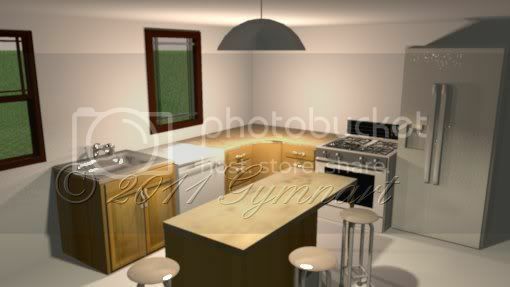 I'm using this version because I'm tring to project the house that my housband and me are buying. It'is on two levels, but each one is on two different levels (4 steps). I've never used a 3D software before SH3D... a lot of instruction are in English (wich is not my language...), in spite of all I'm using it sucesfully! So: very good job guys, you are great! Thanks a lot! Thank you Tiz for your feedback. I just released the version 3.4 Beta 15 with some small bug fixes, and two new help pages for level management (available also here: Adding levels and Editing levels). Please tell me if you feel that my explanations aren't clear enough or that I missed some important information. I released version 3.4 Beta 17 with more bug fixes and the ability to toggle the visibility of a piece of furniture by clicking on its Visible check box in the furniture list. It includes also Italian and Czech updated translation. A special thank to Ondrej Dolejsi, our new Czech contributor. I released version 3.4 Beta 18 where I added a Select object submenu in the contextual menu of the plan that will let the user select an object among the superimposed ones that appear where he clicked. This menu won't appear if there's no object under the cursor. I tried out version 3.4 Beta 18 and so far, I love it! Tonight the version 3.4 Beta 26 brings an important bug fix for people using Sweet Home 3D on a computer with multiple screens. This is related to this bug report, this one and this one (in French). Please, if you use more than one monitor, I'll be happy to know if you have still have problems to run the Import furniture wizard on a monitor different from the main one, or if you can reopen a home window saved at location different from the main monitor. Thanks for your help.